Mook’s Story – Virtual Ability, Inc. If you were writing an article about Virtual Ability and discussing what difference VAI makes to some of us in our lives, I might suggest that you write a book instead. My name is Mook Wheeler in Second Life. I joined Virtual Ability in 2010 after finding it difficult to fit in with other SL groups. In VAI, I discovered a community which made EVERY difference to my life. As an individual with Aspergers, I recently did a presentation for VAI called ‘Why SL (Second Life) makes me more normal than RL( Real Life)’. It offered the community a look at what it is like to live with a neurological autism-spectrum condition which, amongst other things, impacts sensory faculties, obsessive-repetitive parameters, and interpersonal social (“people”) skills. I also have agoraphobia, triggered by my condition. The presentation described how SL/VAI’s specific virtual world options, parameters, layouts and player methodologies made it possible for me to interact and behave almost “normally” with people, something I am unable to do in the physical world. Consequently, VAI and SL’s ability to offer social functions, live music, dances, classes, presentations and professional conferences permits me a luxury I can no longer enjoy in the physical world due to my difficulties. Here, I have met people from many cultures and nations, who can understand what it is like to have a disability and special needs. VAI has enabled me to enjoy a level of social interaction and fulfilment which is practically impossible in my physical reality. But Virtual Ability offers more than merely a place to access activities or socialise. VAI is as much of a family as SL can generate: in fact, VAI is a more dedicated family example than many real life families. Its members have been touched by disability, illness and their difficulties, and as such show a degree of compassion, understanding and patience I have not found in any other SL group. VAI’s humanity makes me want to help in return, to give something back. I try to do this through involvement and participation. In my experience, VAI makes a massive difference to people with disabilities. Being a member of this community is life-changing. It is life-affirming. VAI is a life-line, a helpline, a social connection, a school and community centre, and a field of friends, supporters and peers. It is a community of people who understand you, or at least try to. PWDs (people with disabilities) can be part of an enlightened group which does not judge them, and which is not indifferent to, or dismissive of, their needs. VAI, apart from its informational offerings, is a virtual emotional and psychological assistive companion and carer, as important to many PWDs as any real life counterpart. 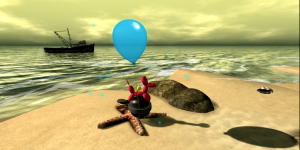 In addition, VAI is important to the very conceptualisation of a virtual world: as both a community and an organisation, VAI provides expertise as a resource on disability and chronic illness information, and on adaptations and accommodations necessary for full and equal participation in virtual worlds. It is an example of a 2D/3D technology which has produced real-life, real-world impact on people – emotionally, mentally and even physically. In my opinion, VAI has no equal in SL or any other virtual world, and very few in the physical world or online. In addition to its classes, exhibitions, libraries, presentations and international conferences, VAI fights for disability access across communication channels, incorporates Universal Design in all its sims, and constantly seeks to educate about disability. Particularly in SL, where it is even easier for people to be ignorant, careless and dismissive about disability needs, I believe VAI’s importance cannot be overstated. When I tell others about Virtual Ability, I say “VAI saved my sanity and life.” And I go on from there. I tell them that in nine years in Second Life, I have never seen the level of empathy, compassion, kindness, willingness, selflessness and patience in any other group compared to what I have witnessed in Virtual Ability. We are a community of people who have personally experienced or witnessed disability and chronic illness, and society’s often negative or discouraging response to it. In my view, VAI’s humaneness is an important reassurance against the often impatient and hedonistic social landscapes of SL. As an Aspergers individual with a PhD in sociology and cultural studies, I see the world, both virtual and physical, through a fairly unique lens. As one of the family of Virtual Ability, I also experience life through the eyes of a community member, and can testify to a significant personal growth produced solely through this interaction and belonging.